If you haven’t heard of Radon before, it’s a German bike company which sells direct to consumers exclusively through the Bike-discount.de website – with the Swoop 170 being the firm’s long-travel enduro machine sporting (you guessed it) 170mm of travel both ends. Although this is billed as a “first ride” report, I’ve actually had three excursions on the Swoop so far. 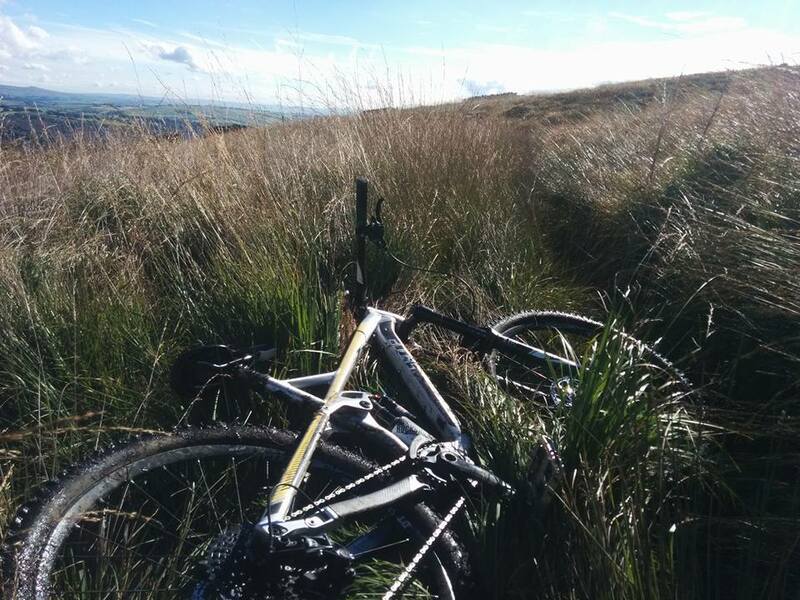 One trip to the Peak District which was marred by a broken reach adjust lever giving me chronic arm pump and two decent outings on my local trails at Rivington. I would have written this after the first local ride, but I was so impressed with the bike that I wanted to get out on it again – just to make sure it wasn’t a fluke. The Swoop on a hazy golden evening in Lancashire. Billed as a “superenduro” bike, the Swoop has an aluminium frame with a classic four-bar suspension layout, “boost” axle and BB spacing and very modern geometry. The Swoop 9 1×11 which I’m riding is a total Sram-fest featuring the marvelous Rock Shox Lyrik fork (in 170mm non-boost format), a Rock Shox Vivid Air handling the rear suspension, Sram’s GX transmission and Guide RS brakes – plus a Rock Shox Reverb Stealth seatpost. Wheels are DT Swiss’s budget E1900 Spline set, which weigh about 2kg and have 25mm internal width rims. The bike also came with Race Face Atlas stem and bar, Continental tyres and Ergon saddle and grips – though I have fitted some tyres, stem, bar and grips that I already owned. So how much do you reckon for that little lot? OK it’s currently on discount as they sell off 2016 stock, but does £2,100 delivered sound reasonable? With value for money like that, you could consider it a job lot of components with a free frame thrown in – however the frame is probably the best thing about the Swoop. My medium (18in) model has a reach of 460mm, 429mm chainstays and a 450mm seat tube. Figures that are almost exactly the same as my large Kona Process 111. The head and seat angle are adjustable via a neat three-position flip chip. The head angle ranges from 64.8 to 65.8 degrees, with the seat angle going from 74 to 75 degrees. I’ve had the chip in the middle position (65.3 degree HA) for my rides so far. First impressions aboard the bike are that it feels comfortable right away – the sizing is spot-on for me and it pedals and steers as you’d expect. Spinning along on the flat it makes reasonable progress – for an enduro bike wearing a Hans Dampf and Magic Mary tyre combo. Climbing doesn’t hold any nasty surprises either. There’s a bit of bob from the Vivid Air (which has no platform switch), but it feels otherwise taut and efficient – and you wouldn’t guess it had 170mm travel unless you were told (or read it on the suspension linkage). Tarmac is the only place the bike actually feels like a drag (the tyres being a big part of that), but on the other hand it’s an excellent technical climber. The supple Vivid Air gives great traction and I had no problem getting up an awkward ascent that I’ve only cleaned a few times previously. It’s on the descents that you’d expect the bike to shine though – and the geometry offers a superb balance of stability and responsive handling, with the frame giving the bike just the right level of stiffness in my opinion. The Vivid Air was an unknown quantity to me, but I’ve been very impressed. It feels a lot like a CCDB coil shock, tracking the ground superbly and giving loads of grip – while feeling utterly composed. It’s a nicer quality frame than I was expecting from the website. Well-matched with the Lyrik, the bike feels luxuriously damped both ends – but is responsive with not a hint of wallowing. Heading into rough terrain, it keeps its composure and allows you to make the odd crank of the pedals without getting unbalanced – though the low BB means pedal strikes are likely if you’re not careful. Of course that low BB also helps give the Swoop excellent cornering manners – with the long front end and short-ish chainstays making it feel planted, yet nimble when it needs to be. I expected it might be hard work on flatter trails, but ride feel is something you can’t pick up from spec lists and geometry charts – and I was in for a pleasant surprise. Riding a long-ish bit of rutted and rocky moorland trail with a shallow gradient (Shooting Huts, for those who know Rivi), I was genuinely astonished to find the bike freewheeling and picking up speed where I’d usually be pedaling just to keep going. The suspension has a lovely fluid action and feels like it’s eating up bumps and turning them into free speed. It felt a bit like having a stiff tailwind – and I almost checked for a hidden motor. On steeper trails the Swoop feels poised and stable so far, though I have yet to ride anywhere consistently steep and rocky on it. Despite the DH shock and long wheelbase, the bike is far from a “glued to the ground” ride. It’s easy enough to hop sideways from one line to another – but doesn’t get easily deflected by rocks and roots. The wheels might have pawls rather than DT’s star ratchet hubs but they are nicely finished and feel sturdy for their reasonable weight. If I do get a snazzier set, I’ll definitely keep these as back-ups or for uplift use. Mention has to be made of the really smart spec by Radon. A 30t ring is spot on with Sram’s 10-42t cassette in my opinion. 170mm cranks mean less pedal strikes and there’s even a nice E13 chain device included. I did change a few bits as mentioned above, but I really didn’t need to. The frame is nicely done too, I love the raw finish and the yellow and black decals look better in the metal than on the website. The hardware all seems decent enough and the flip chip is simple to adjust – though I did spend a couple of minutes looking for the instructions before I realised they’re printed on the frame. D’oh! An unexpected benefit of that brace from the top tube to the seat mast is that it makes an excellent hand hold for porting the bike about or hoiking it over gates. Weight-wise, it’s quoted as being about 32lbs and it certainly doesn’t feel heavier than that. 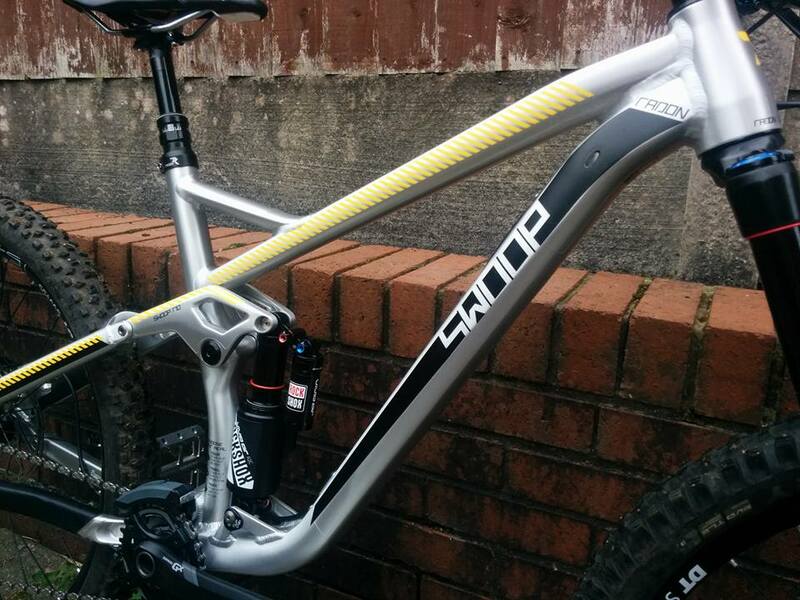 It’s absolutely on par with other aluminium enduro bikes, and probably lighter than a fair few of them. I’m already convinced that this is the best bike I’ve ever ridden. The balance is sublime: with handling and chassis and suspension performance all just right. It’s a delight to ride and I can’t wait to head up to the Lakes and Scotland with it. Radon bikes might not be a common sight on UK trails at the moment, but the price and performance of the Swoop suggest you’ll be seeing plenty of them over the coming years. I’m not sure what the exact definition of a superenduro bike is, but I do know that this is a super enduro bike. So how tall are you exactly? Still trying to figure out if i should go small or medium. I’m on a medium Banshee Rune right now and i’m 5’7″. Hi Julien, I’m 5ft 8in but I have short legs so the long reach on the medium is perfect for me. Can you ride something else with a similar reach to see how it feels? Interesting. I’m very tempted by the 2×11 version. Mainly due to it having a Monarch instead of the Vivid shock. The Monarch has 3 position lever so should improve the climbing ability a lot. And if i want a 1×11 all i need is a new chainwheel. I’m 5ft 9in so medium should be spot on for me too. Did you go 1×11 for the downhill type rear shock or because you wanted 1x straight outa the box? Hi, I wanted the Sram 1×11 set-up and the Vivid Air rather than the Monarch. It’s actually a very good technical climber but it does bob on fire roads and tarmac. The improved grip is worth it for me though. Great review, did it come with a 150mm or 125mm drop reverb? On the pedal bob is it bad on a seated fire road climb? Such that you’d fall behind mates? Fire road and tarmac climbs are a bit of a weak spot with no platform on the shock, but I am not getting dropped by people I can normally stay with. Great review and you’ve convinced me to buy one as an insurance replacement for my crash damaged Transition Covert 650b. Im just a bit curious about the sizing. At just over 5′ 10″ I’m tempted to buy the large rather than the medium. My Covert is a medium and it felt a little cramped but the Swoop has a longer reach. Radon recommend a medium for my height. Does it come up as a large-medium or slap-bang, in-the-middle medium? Also, is the freehub XD or Shimano? As I’m looking to replace the wheels with some Hope Tech 35w. Glad you found it useful Gav – mine has an XD freehub for the Sram cassette. Shimano equipped ones may be different though. It’s a long medium compared to most brands. I am 5ft 8in but have short legs and a long body, so I usually need the length of a large bike and seat tube of a medium. The medium Swoop is the same reach as my large Kona Process – and they’re not short bikes. Does that help? I’d say Radon are probably right for you, unless you like a particularly long bike? I’ve been running geometry figures through my head for a few days now and it seems a Large is probably a better option for me. My old Specialized Pitch Pro was a large and has a slightly longer reach than a large Swoop but it felt just right with a 50mm stem. I’ve just spoken to a friend who is the same height as me and had a medium Transition Covert who said he went to a large when he bought a Transition Patrol (similar geometry) and is over the moon with it. I’m gonna try the large and if it’s too big, I’ll cry haha. I’m ordering the Swoop 170 9.0 which comes with the SRAM groupset so I’ll have to order an XD freehub with my new wheels. NP, sounds like you know what you’re doing. Will you pop back and let me know how it works out? Has your bike arrived yet? I’m also looking at purchasing one but stuck on sizing too, I’m 6ft and not sure whether to go medium or large? Don’t know of going medium will make it feel a bit more playful but also not sure if the seat will go high enough when needed? Did you buy what size? 6ft here im now in a commencal v4 in M think a little short to me. Hey Hugo, thanks for your kind comment about the review. I think some 6ft riders would be happy on the 18in, since it’s longer than a lot of “large” frames – but they might be missing the benefit of the long front end. No i have a M commencal V4 and fitt a little small. 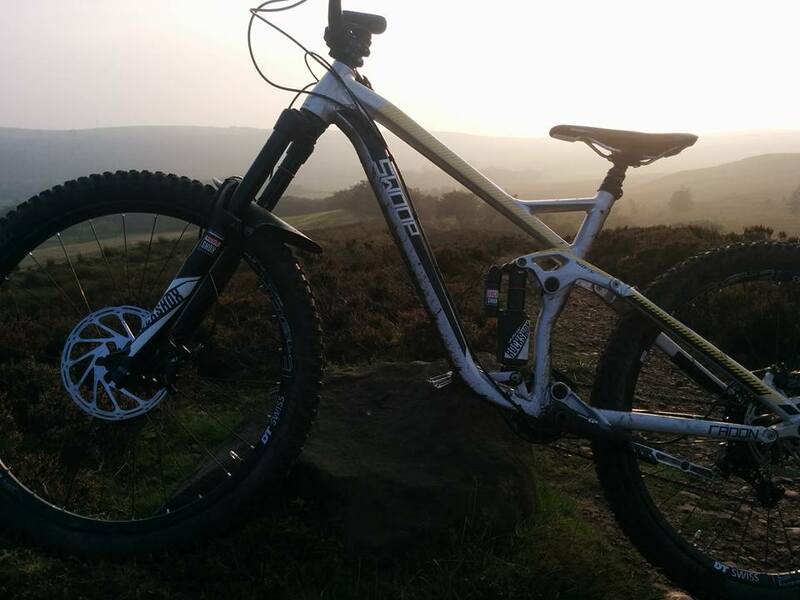 any info from 6ft riders appreciated here too – radon recommend a medium but on most other bikes id be on a large – not sure what to do – I have a 32inch inside leg – anyone tried both? And bouth measures state 19″ size. Will post some feedback about my opinion in size 20″ for me. I’ve had my XL (22″) Swoop 170 8.0 since May ’16. I’m 6’2″. I had a demo on a Whyte G-160 size L which has a 495mm reach and I loved how roomy it felt. Would’ve loved a G-160 but spec for price I went for the Swoop which is a bargain, especially before the exchange rate went crap when I bought mine. Hi Ryan, I am 187cm with crotch 93 and I am very confused between 20 and 22, what would you recommend? There are only 20 inch versions left of that bike. I would really like to get one. With the 65 mm stem it comes is is most definately too large but I am planning to get a 35 mm one. I have tried large capra which has reach of 445 and 50 mm stem. Even with shorter stem rdon is still 13 mm longer than capra. Do you think it is noticable. And do you think 508 mm reach is too much for 180cm-ish rider? Im 186cm (crotch = 86cm) and I think that better option for me is 18″. What do you think. I want to buy radon swoop 170 9.0 2×11. Great review, on their spec sheet it shows the rear is only Boost spacing, no mention of Boost Lyric, can anyone confirm its Boost front and back, I also rode a Large MetaV4, find it very short, I’m thinking of getting a 20″ Swoop ! Hi Simon, this model came with a non-boost fork. You should ask Radon if you’re looking at a different model though. In your review it’s says you were using a boost 170mm lyric fork, did you change that then to a boost version ? Good spot, I meant to change that after I found out it was 100mm. Sorry, I don’t understand. so the bike came with a non boost Lyric fork. That’s what the spec sheet at radon says. In your review you said the fork was a boost Lyric ? Did you change forks? Or is that a typo, ? It came with a standard, non-boost, 100mm Lyrik. Thanks for the great review! I’m considering that bike too. How long is your stem? Do you feel that the bike is easy to manual and bunny hop? I started with a 35mm stem, then went to 45mm for more stability. I’m gonna try 35mm again, but I’ll probably end up on 40mm. It hops great, manuals over logs and stuff are easy. Cool, thanks for your insight! Stace, I have the bike in front of me, how do I adjust the Flip Chip ??? It’s a little hex key or screwdriver to undo the chip each side and reposition, the graphic on the seat tube tells you which position is which. Any advice on how to set up the Vivid shock, other than the base setting on the RockShox website ?? Sorry I thought I replied to this before Marc, is this something you still want to do? Hi there from France. I’m 6’4, and got the 22′ Swoop 9.0. Love the bike. Chose this model rather than 8.0 to get a FOX 36 and Float X both in performance elite (improved damping etc.) + 2x 11 shimano drive train as I am not keen on 1×11 sram ones. Doesnt work for me (going up mountains etc.). Came here to have advice on how to adjust the flip chip and found this great review + the flip chip advice. Many thanks! Get this bike you will love it! Let me know if you have any questions. Thanks for the kind words about the review Cedric. I used a 45mm stem for a while but have now settled on 35mm, which I think makes it a bit better for me getting round tight corners. Still loving the bike, had some great rides in Scotland on it last month and will do a long term review soon. Hey Stace, sorry for the delay, somehow I never received a notification that you replied. Thanks for getting back yo me and the stem advice. I am still unsure of what size stem to get… Thinking of getting Renthal Apex 40mm stem and fatbars 780mm handle bars (31.8 diameter) though. Should be OK for now, and maybe I’ll try a 35mm stem later. Shame I didnt get this bike earlier – could have met you in Scotland! I am a Frenchman living in Glasgow… When I wrote my initial message last Sunday, I was in the van going to Glengoe Mountain Resort for some uplifts – second outing on the bike but first real test :)… I hadnt worked out the flip chip back then yet…. So I rode it in the steepest geometry that it came with (TOUR) without realising hehe. Bike handled great and I thought I was on the middle setting… Did the red trail, and the black once. Crashed at the end of the final red run because I was so pumped… This week, I set the geometry as slackest and wow, it changed completely! It’s like a different bike. Really hard to pedal uphill now. Think I’ll reset to middle geometry (TRAIL) for now for my local downhill woods (Lennoxtown, north of Glasgow) and set to slackest for uplift only! Great review indeed and really looking forward to your next review on the Radon now that you’ve had a taste of Scotland! Being from Scotland myself and looking to buy a Swoop I really hope your not disapointed. It was fantastic riding it up in the Highlands this time last year. I must pull my finger out and do a final review soon!